Have you gone to college only to find that you are in debt up to your eyeballs? Student loans can be very scary! Paying student loans can be hard on a young person just starting out. Just remember that just because you have not landed that perfect job just yet does not mean that your student loans will go away all by themselves. Paying student loans back is a great step to earning a solid financial foundation for your future. 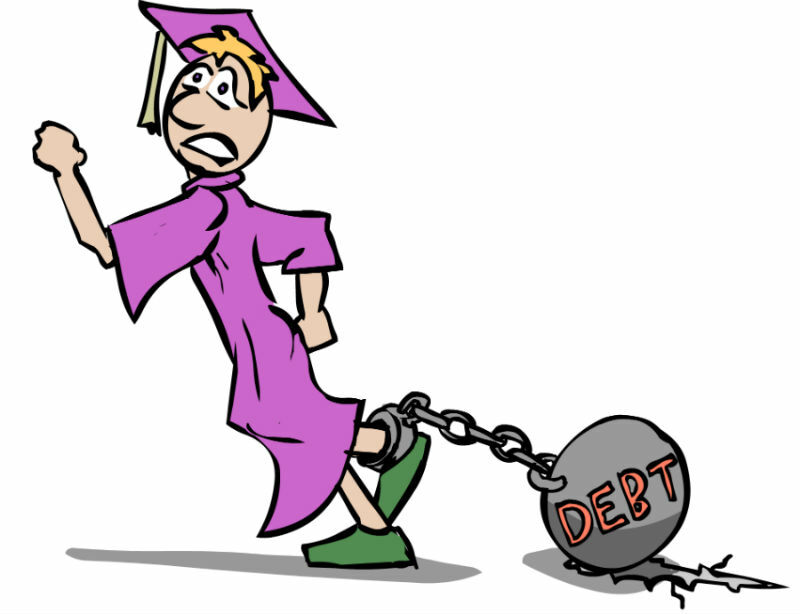 When you graduated from college the first thing most students think about is, “Time to relax for a few days then off to beat the streets for a job!” When that first student loan bill arrives in the mail it can be very nerve wracking and overwhelming. However, you can make the transition from college student to a professional career individual by understanding the repayment process of paying your student loans off. Making Payments – Once you graduate you will be responsible for making payments to your loan servicer. Each loan servicer may have different ways and times that the payments should be submitted. *Note* it is the students responsibility to contact the loan server even if he or she has not received a bill. Loan services – A company that collects payments on a loan, responds to customer service inquiries, and performs other administrative tasks associated with maintaining a loan on behalf of a lender. If you’re unsure of whom your federal student loan servicer is, you can look it up on www.nslds.ed.gov. Choosing a repayment plan – When it comes time to repay your student loans you will have a few choices for what type of payment plan will best suit your needs. The type of payment plan you choose will determine the amount and length of time you will be paying. Deferment and Forbearance – If your financial situation is hard such as, unemployed, food stamps, returning to school, or going into the military this is the type of payment plan you can chose to postpone or lower your payments. Forgiveness, Cancellation, and Discharge – This service is for students who have become totally or permanently disabled, or the school closed while you were in attendance, and certain types of teaching services and other such situations. This will put your loan in forgiveness, cancellation, or removed. Understanding Default – You never want to go into default with your student loans. The college, the loan servicer that made or owns your loan, loan guarantor, and the federal government all can take action to recover the money you owe. If you need assistance with your loans, call your student adviser or contact your loan servicer today! Congratulations! You graduated. And you, like countless of other graduates, have pretty outstanding student loans to pay back. Although there is no magic button, there are a few smart money tricks to help along the process. Firstly, take advantage of the fact that many loans do not need to start being paid until 6 months after graduation. This alleviates some pressure, but not all of it. Depending on the type of loan, interest may or may not accrue during these months. There is never any harm in paying both interest and principal before you need to. Secondly, you may qualify for a loan deferment of forbearance. Deferments and forbearances mean that you do not have to pay off any of the loan for a specified period of time. Interest may or may not accrue, depending on your loan company. You must apply and qualify for a deferment. Reasons for qualifications include economic hardship, unemployment, enrollment in school, teaching certain under privileged populations (such as Teach for America), working in health care professions, or certain volunteer services such as Americorps. Thirdly, there are a few ways to receive debt forgiveness. Programs like the aforementioned Teach for America often forgive a percentage (albeit not a very large percentage) of student loans. Of course, it is important that they offer forgiveness as the salaries are not competitive enough for you to be able to pay off your student loans and live comfortably. Fourthly, try to pay more than the minimum. The more you pay per month, the less you pay over all. A huge part of making this possible is living slightly below your means. Having an inexpensive rent, not eating out frequently, and limiting unnecessary spending are all factors that help you put a little more towards loans. Paying off loans in a shorter term period of time is like investing in your long term future. The more principal you pay off monthly, the less amount of interest you pay off in the long run. Lastly, never be afraid to call your loan company to see what they can do for you. They are there to help–and to make sure that you do not default. An FHA loan is one that is backed or supported by the federal government. However, this is not the only distinction. FHA stands for Federal House Administration, and an FHA loan is put in place when a lender approved by the Federal House Administration provides the insurance required to cover a mortgage-based loan. As such, the FHA insures the loan at a rate of about 1% which is the Minimum Insurance Premium, and the FHA-approved lender covers the cost of the insurance, before providing the loan to the borrower. The scheme was developed to assist borrowers who were not able to cover insurance premiums to access mortgage loans and was developed during the Great Depression of the 1930s. It has however evolved to cover different aspects of the housing and real estate markets and its also a competitive type of mortgage insurance financing, while still retaining it’s original objective of protecting both the underprivileged as well as the FHA-approved lenders who are providing the loan. If you are interested in getting an FHA loan, the first and obvious step would be to find out which financial or credit institutions are approved by the Federal House Administration; this information is available from the FHA and federal finance databases. There are a diverse number of lending institutions that are FHA-approved, and so it would be wise to look through their various terms and conditions and see which best suit your needs. The financial institution or firm that is approached for the loan then does an assessment of its prospective customer, including past debt history as well as current income in relation to the loan facility they are seeking. After this, the assessment puts together a repayment proposal that the prospective borrower examines. The FHA loan traditionally offers mortgage loans and refinancing at interest rates than you will find elsewhere and is also able to cover credit worthy individuals who do not meet the usually stringent expectations of other non-FHA approved lenders. For instance, a blood relative will be allowed to co-sign for the loan even though they may not be living within the residence of the premises being mortgaged as a form of guarantor. Accessibility is also insured with low initial deposits, with some FHA-approved loans enabling the home-buyer to deposit as low as 3.5% in the initial acquisition process. Apart from being more easily accessible to people that cannot afford the usual mortgage financing, FHA loans also are adjustable in terms of their rates, particularly during periods of low market interest rates, thus passing on the benefits of lower interest to the borrower. It also allows for a combined interest rate system on the loan, where for a certain period the borrower is paying back the loan against a fixed interest rate for about three to five years, and after which, the interest can follow market fluctuations. This is referred to as the Hybrid Adjustable Rate. FHA loans are thus an important aspect of the mortgage financing industry, helping provide the less financially privileged with access to mortgage financing while also acting as a buffer to strictly commercial enterprises in the market place.